MORZiNE: Superb 2 bed/2 bath South facing apartment + bunk bedroom of +/- 65m2 in a pleasant small residence of 5 apartments completely renovated to new build standards with fantastic mountain views. 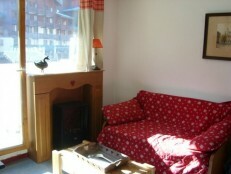 The residence is situated just opposite the ski shuttle bus stop and at 1.5kms from the village centre. includes: large balcony, private sun exposed garden, large cave, garage space & extra utility room. High quality finish, very good value for money!